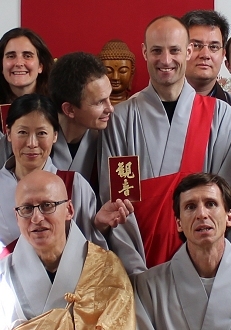 The Kwan Um School of Zen is an international organization existing throughout the world, with over a hundred temples, monasteries, centers and groups in Asia, America and Europe, with linked branches in Australia and Africa. Its roots go back to Korea, where its founding teacher, Zen Master Seung Sahn, was born, became a monk, attained enlightenment and received Dharma Transmission. His line of transmission goes back through famous Korean Zen Masters and the great Chinese masters of the Lin-chi line to Bodhidharma, and so back to the Buddha.